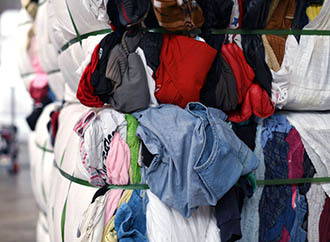 The textile waste is one of the protagonists of the Debate Table 'Residuos e Innovación. Separate for recycling 'that takes place on Wednesday June 13 in the framework of the Forum of Cities. The textile appears on this table at the height of other waste such as packaging, glass or paper. The third edition of this forum is held in Madrid IFEMA from June 13 to 15, in order to offer a new perspective on the world of cities, their innovative management and the role played by all the actors that are involved in the urban environments. The waste and its correct treatment is one of the key pieces for the sustainable development of the cities of the 21st century. Rosa Trigo, Technical and Innovation Director of Ecoembes. Manuel Domínguez, General Secretary of Repacar. Laura García, Technical Director of Operations of Ecovidrio. Buenaventura González, President of Sigaus. Gabriel Leal, Secretary General of Signus. José David Moreno, National Promoter of Humana Fundación Pueblo para Pueblo. The city for citizens will be the main axis on which all the themes will revolve, given that this approach has always been the distinguishing feature of the Forum of the Cities of Madrid. For this reason, part of the program will be devoted to discussing the so-called 'New Urban Economies': from the collaborative, on which a Reflection Group has already been created, to the circular through the green, blue, common good economies , etc. This vision of the city and the role of citizens will be addressed from the perspective of the 2030 Agenda and the Sustainable Development Goals. Beyond Objective 11 dedicated specifically to cities, there are others of the SDGs intimately related to urban environments: climate change, water, clean energy, responsible consumption or reduction of inequality are just some examples. The Forum of the Cities is part of the Forum Environment and Sustainability FSMS IFEMA Feria de Madrid, which also includes the International Fair of Urbanism and Environment, TECMA or the Hall of Recovery and Recycling, SRR.